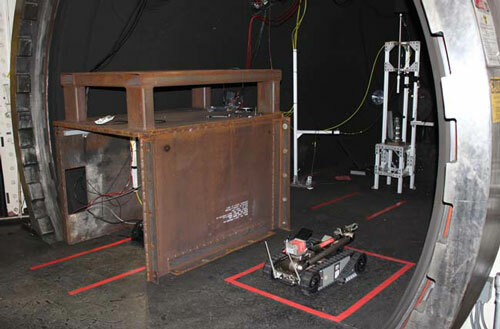 (Nanowerk News) LEXI is a new robot at work in the firing tanks of the Lab's High Explosives Applications Facility (HEAF) and the work that's done there for the National Explosives Engineering Sciences Security (NEXESS) Center. The tri-lab program is funded by the Department of Homeland Security to assess threats from explosives and to evaluate countermeasures. NEXESS was created in 2007 after British authorities foiled a plot by terrorists to blow up as many as 10 passenger planes in mid-air using peroxide-based liquid explosives. LEXI is a new robot at work in the firing tanks of the Lab's High Explosives Applications Facility (HEAF). "We've been looking at various homemade explosives in detail ever since, both experimentally and using modeling and simulation," said Lee Glascoe, who heads LLNL's participation in NEXESS. "We need to see what a terrorist might use and how effective certain types of explosives might be in bringing down planes and other targets of interest." "There are a lot of materials that we look at, and many are safe to work with in contact, such as with your hands, if you know what you are doing," he said. "But there are many that are not; particularly if they have certain additives like sulfur or aluminum. Typically the explosives' ingredients handled by themselves are benign, but mixed together, they become dangerous." Chemist Sabrina DePiero agrees. "They're jumpy enough that we don't want to be around them once they're mixed." In order to minimize risk to personnel, the NEXESS team realized remote operations for unsafe explosives would be necessary and a robot designed for handling explosives would be an important component of the overall remote operation. After reviewing three different models, the iRobot Packbot 510, manufactured by the same company that created the Roomba vacuum-cleaning robot, was chosen and dubbed LEXI for Livermore Explosives iRobot. DePiero is responsible for preparing the materials in an assembly room at HEAF. Following a procedure she developed that is designed for safety, DePiero carefully layers two or three ingredients including a fuel and oxidizer in a plastic cylinder. "Because they are not intimately mixed, they're not sensitive at this point and we can handle them. " She then walks them to one of HEAF's several firing tanks and inserts the container into an acoustic mixer. She exits and the tank and secondary doors are closed. Once the area is secure, the acoustic mixer is started by remote control. It vibrates the materials at the system's resonance frequency to create the fully mixed and, now, dangerous to handle, explosive. During the remote mixing operation, LEXI is parked behind a blast shield inside the tank. After the procedure is complete, LEXI rolls to the mixer and removes the cylinder containing the explosive mix and transports it to the tank's firing table. Once that delicate task is complete, the tank door is opened, LEXI rolls out, and the explosives can be detonated. According to Glascoe: "A real challenge was configuring LEXI and all the equipment for making, mixing and handling these explosives at HEAF. Before LEXI, we weren't able to look at some of these explosives because of safety concerns." He credits DePiero and her team with successfully dealing with the planning, the design process, and implementation, including extensive reviews by building and safety coordinators.